only used at the Monday show. Probably they did not fit in with the smalles stage concept. First off, I've never seen the Rolling Stones perform live before. So naturally I was very excited when it was announced in Singapore's main paper about six weeks ago that they were playing two shows in Singapore: Monday 24 and Wednesday 26 March. However, I nearly fainted at the price - S$100 for the cheapest seats (in the nosebleed section of the rafters) up to the top price of S$500 for front row seats! So I have to admit I put the idea out of my mind, after calculating what it would cost. Plus it galled me, sort of, that the so called 60s blues rockers from working-class London and supposed anti-establishment rebels, could now be charging so much for seats. But it kept niggling in my mind - "this is the Stones, maaaaan!" How could I miss such an opportunity? So fate intervened a few days ago when a friend called to say that he was going with a couple of mates and had a spare ticket to sell, though it was in the S$350 seat section! After a bit of thought I decided it was a "0nce-in-a-lifetime" opportunity. Additional deciding factors were that this is a good time to see them, as they're playing a greatest hits show in support of the Licks CD, rather than on a tour flogging a new album and breaking in songs nobody has heard before. Another persuasive factor is that Singapore's Indoor Stadium seats only 12,000 people - this is a fairly small setting compared with the larger venues the Stones normally play (eg. they are playing London's Wembly Stadium later this year, which holds 50,000 people!). So it's a great opportunity to see the band close up in a more intimate venue. While my view of the stage and band was okay, I found that I was looking at the giant video screen at the back of the stage quite alot, which seemed a bit silly (I mean, in that case, I could have stayed home and watched them on DVD!). Also, to be frank, the crowd around me were a bit staid and uninvolved, which made it a bit awkward for me to let go and scream'n shout. So after the 10th song, while Mick was making introductions of the band, I casually strolled up to the very front lip of the stage, standing only one row back, and nobody stopped me ... so I spent the rest of the show in the very top-price seats with a fantastic close-up view of the world's greatest rock'n roll group (no contest!). I was so close I could literally count Mick Jagger's nostril hairs! All of the band members mage regular trips to the side of the stage where I was standing - so I got to see Mick, Keith, and Ron Wood at very close range, only a few feet away. Awesome. Charlie Watts, of course, was sitting at his drumset at the back for the whole show, and as usual for him, was expressionless most of the time except when Ron Wood (the band jester) could coax a smile out of him. The show was utterly fantastic. I've heard the tour referred to as the "Stones In Wheelchairs" - nothing could be further from the truth. While the faces are certainly craggy and creased, these guys moved around on stage like teenagers. Mick Jagger in particular is amazing - the face of a 60 year old and the body of a 20 year old! He didn't stop moving, dancing, jumping and pouting for the whole two hours. Granted, Keith shuffled around for much of the concert looking, er, slightly "stoned" - but grinning often, and striking guitar god poses - but Ron Wood actually stole the show with his boyish antics and sense of fun. He was clearly having a great time. He regularly flicked his guitar picks into the audience, and one time a pick landed neatly down the front of the blouse of a girl standing just to my right. Ron thought this was a huge joke and spent the next several minutes leering at the girl and laughing with the backup singers. The songs were amazing - a great selection. Imagine my delight: Midnight Rambler and Gimme Shelter at the same show! Along with all the classic radio staples: Jumping Jack Flash, Satisfaction, Sympathy For The Devil, Honky Tonk Women, etc etc. The sound quality was superb - not perfect, mind you, but hey, it's a sports stadium - if you want perfect sound quality stay at home and listen to the stereo. The treatment of the familiar songs was a bit different - the same riffs and lyrics were there but the songs were given a different edge to them, sometimes harder and sometimes softer. Sympathy For The Devil, for example, sounded more menacing and driving than the original version (and Mick came on stage in darkness wearing a long coat with flashing lights ... quite effective). Angie, meanwhile, which I normally find a bit sappy, was a triumph - Mick dismissed the backup singers and horn section and just sang it with only a spare guitar and bass backing - and blew the crowd away. What a fantastic showcase for his voice, and it just elevated the song to a whole new level. At the end of the show I left with my ears ringing (it subsided by this morning), feeling that there was still hope for rock'n roll, in spite of insipid boy bands, slickly packaged teenybopper girl singers, shrieking wanna-be divas, and pathetic foul-mouthed rappers. A bunch of 60 year old "geriatic rockers" blew them all away. 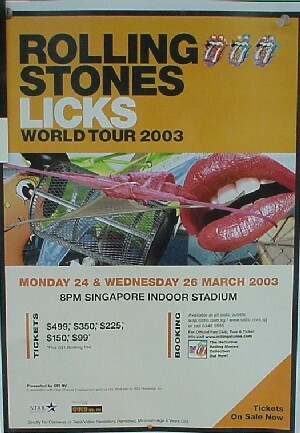 At the first concert the Stones played in Singapore, on Monday 24 March, towards the end of the show, two giant inflatable scantily clad female dolls appeared on either side of the stage, each one straddling a long pole - one with a flag showing the classic Stones tongue insignia, and the other with a Singapore national flag. This apparently shocked the management of the Indoor Stadium - to such an extent that they complained after the show to the Hong Kong-based organiser, Live Limited, and requested that the dolls and flags be removed. Bear in mind also that the Singapore Prime Minister's Office has issued guidelines which state that the Singapore flag must be "treated with dignity and respect". Any use of the flag - whether for commercial, educational or entertainment purposes - requires prior written consent from the Prime Minister's Office. It probably didn't help that the Prime Minister's wife, Mrs Goh Chok Tong, was at the Monday concert. Other rumours are circulating relating to the sudden departure from the concert - just after the dolls appeared - of Professor Tommy Koh, Singapore's Ambassador-At-Large and a prominent government official. He apparently left "in protest" about 30 minutes before the end of the concert. However, a source close to Koh dismissed the rumours, saying that he left early only because his wife was tired. Whatever the reason, the dolls were certainly missing from the second show on Wednesday 26 March. The Hong Kong-based promoter of the show, Live Limited, has apparently taken a loss of Sing$2 million on the two Singapore concerts. They were bought to Singapore by Live Limited at a cost of Sing$3.5 million. With tickets costing from $100 to $500, it is the most expensive rock concert held in Singapore (beating out the previous top tier price tickets of $200 for Michael Jackson in 1996, $395 for Whitney Houston in 1997, and $260 for Mariah Carey in 2000). In order for Live Limited to break even on the Stones concerts they needed to fill 95 percent of the 8,500 seater stadium on both nights. That works out to about 8,000 seats per night, at an estimated total ticket revenue of $7 million for both nights. Monday 24 March pulled in 6,500 fans, while the Wednesday 26 March concert attracted 7,200 fans. Industry sources reckon that the 5,000 or so unsold tickets for both nights - plus concert taxes, GST, advertising costs, ticket and admin charges - add up to a loss of about $2 million for the organisers, i.e. more than one million US dollars. Colleen Ironside, Managing Director of Live Limited, said "It's got nothing to do with other people or observers. It's not their money. It's an honour to have worked with the Stones - I'll do it again." Thanks to Jeremy Palmer for news information.